Former IDF Chief Rabbi Ronski slams minority elitists for accusing religious of 'military revolution' at seeing religion becoming central. The debate on "religionization" in the IDF held by the Foreign Affairs and Defense Committee's Subcommittee for Personnel in the IDF on Monday has left former IDF Chief Rabbi Brig.-Gen. (res.) Rabbi Avichai Ronski livid. Speaking to Arutz Sheva, the rabbi said "instead of trying to clarify why such a great vacuum was created (in the army), into which many members of religious Zionism entered - instead of that, they're busy with the 'danger' of religious Zionism to the IDF." "Only last week I took part in a conference of the Council for Peace and Security, and there they accused us of staging a military coup; Dr. Amir Braun claimed that we are trying to take control the army in order to foil decisions by the elected government and the audience applauded," recalled Rabbi Ronski. According to the rabbi, there is a small group of elitists who are inciting against the religious soldiers in the IDF, noting "instead of dealing with Hamas, they worry when they see soldiers going to the Kotel to say the hagomel blessing after the war." 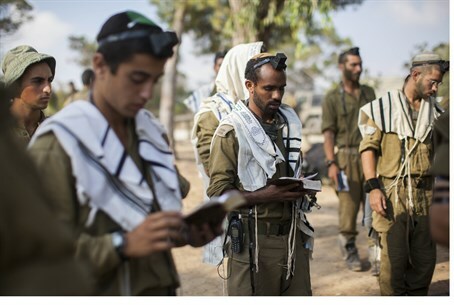 "They see how the religious Zionist community has become a central player in all parts of the society and the army, and they are trying to undermine this wonderful spirit," said Rabbi Ronski. "But we need to continue doing things with confidence and joy." "Eighty percent of citizens of the state are (religiously) traditional and they want the connection to the tradition. Therefore, all those who hold conferences today on 'religionization,' there's a touch of anti-Semitism to it," Rabbi Ronski charged. He concluded "they're taking the massive entrance of religious to the army, and trying to present this process as a negative process and even give it an academic name, 'religionization.'" "Religionization," or hadata in Hebrew, is a recently invented word that does not exist in the dictionaries. A religious IDF Chief of Staff? Responding to Rabbi Eli Sadan's comment that Israeli society is not yet ready for a religious IDF Chief of Staff, Rabbi Ronski remarked: "that's a ridiculous statement, most of the public in Israel is definitely ready for a religious Chief of Staff, and if there will be a religious Chief of Staff that will be no worse than anyone else." "The public wants people who also have inspiration," said the rabbi. "I know that today even the IDF Rabbinate is wary of journalists and is afraid to bring people like me to give speeches. But in practice, in all the recent wars there was a great demand to hear my words in all units, including the elite ones." Speaking about the first counter-terror operation in Gaza in 2008-2009, the rabbi said "in (Operation) Cast Lead they brought me in to several places in tanks, they know that the rabbis have things to say that strengthen the fighting spirit." The Knesset discussion on "religionization" and "religious radicalization," led to other angry responses, including from MK Moti Yogev (Jewish Home) who was present at the debate. "The enemies are Hamas, Hezbollah and Iran, and not religious soldiers in the IDF," Yogev said at the session. "This discussion doesn't need to take place in the Israeli Knesset and doesn't need to preoccupy army officials and waste their time." One of the topics raised in the discussion was the message sent by Givati Brigade Commander Col. Ofer Winter to his troops at the start of the operation, in which he wrote that the brigade was going out to fight against "the terrorist Gazan enemy that curses, reviles and insults the G-d of the campaigns of Israel." The invocation of G-d made a stir in the media, and led Defense Minister Moshe Ya'alon (Likud) to criticize Winter, noting not all IDF soldiers are religious, or even Jewish. Many have argued that regardless of the religious identity of individual soldiers, the IDF, as the army of Israel which defines itself as the Jewish state, exists first and foremost to defend the Jewish state and Jewish values.